Most of us have heard of this joke before – a frog meets up with a fortune teller to find out what’s in store for the new year, only to have an extremely optimistic outlook of a beautiful lady who takes such an interest in the frog while overlooking other more suitable candidates around her as a life partner. Little did the frog realize that he was going to end up as a specimen in the biology lab! 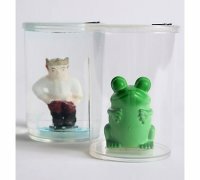 Well, this Frog-to-Prince transformation kit should be reserved only for little girls who have a fondness for the particular fairy tale that involved a tryst between a human and an amphibian. It takes around 72 hours for the frog to turn into a 4″ prince, and there is no word of any reversion. For $6, this is one of the more interesting items you can pick up online.